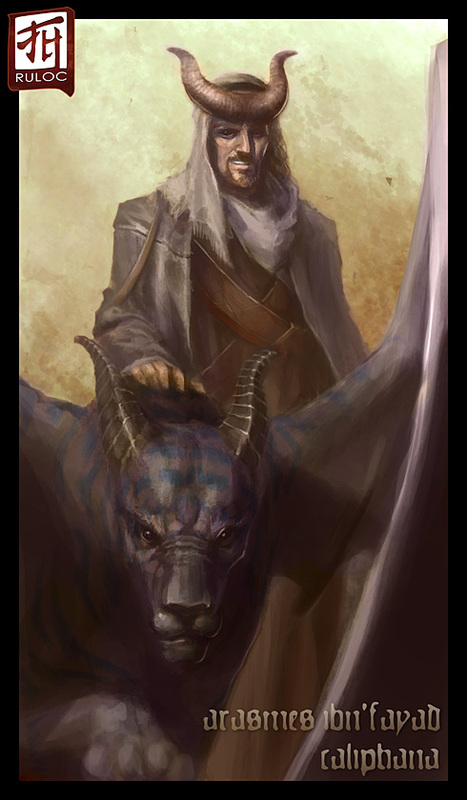 Arasmes ibn'Fayad is a Kyton-spawn tiefling summoner. He is from Katapesh and has a very Persian look to him. He is relatively muscular due to the muleback cords he wears. He wears a Khefiyeh and dresses in dark colors. Tan skin tone and jet black hair he has tattoos of silver and black chains all over his body that change at random times as if they are moving (this is due to his fiendish heritage) he also has jet black pupil-less eyes during the day and silver pupil-less eyes at night. He has a pair of desert goggles that he wears when interacting with most people due to his disconcerting eyes. He is incredibly handsome with a dazzling white smile that he uses to great effect. He is a genuinely good person who fights against his heritage on a daily basis. His eidolon: Not a necessity but would be nice if anyone has time. Caliphana looks like a strange cross between a great cat like a tiger and a dragon. Her teeth and claws exude an acidic liquid. She has great dragon like wings. Her fur is a deep purple with dark blue markings like tiger stripes. She has a pair of black horns that sweep backwards from her head.